Marayada (Rules and Procedures) for performing the last rites (funeral) of a dead body. According to Sri Sat Guru Ji’s order, no one should weep for the departed soul since it causes a lot of anguish and pain to the departed soul. The dead body should be bathed. The feet of the dead body should be kept towards the East as much as possible. 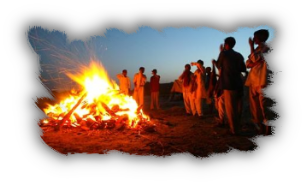 Ardaas should be performed before lighting the pyre. Everybody present at the cremation site shall take bath and rinse clothes immediately. If anybody who touches the person who has returned from cremation-site and still not taken bath, then even if he has not attended the cremation ceremony; he or she must take bath and rise the clothes also. After returning from the cremation ground, everybody, after taking bath and changing into fresh clothes, should reach the place where the Paath is to begun. After starting the Paath, Karah Parshad is distributed among the Saadh Sangat and a small amount of Karah Parshaad is thrown into the pyre.